Fluid knowledge and beautiful technology. One of my favourite subjects the exhibition takes up is the dérive. In short, an instruction for a city-stroll in which the itinerary is determined by the participants’ intuitive response to the terrain. What interests me from an artistic point of view is the double meaning of the dérive. In the situationistic sense it means ‘to wander off‘, however, it could also be understood as a ‘thing that leads to another’ (as in English, to derive out off…). Thus, when combined, the dérive could be interpreted as a method that leads to sudden or unexpected insights, by means of wandering off. It reminds me of the French philosopher Gilles Deleuze, who defined knowledge not as given facts, but rather as an ongoing process of “becoming’. To study this process, Deleuze says, we shouldn’t ask the question ‘What?’, but instead questions such as ‘Where?’, ‘Who?’, ‘When?’ and ‘How?’. Which brings me back to the dérive, a method that allows you to directly respond to the terrain and put these questions into practice. In the exhibition we see some works of Francis Alÿs who applies these Deleuzean methods in his work. 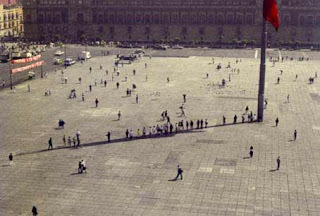 Mexico City has been the setting for several walking performances, one of which is shown in the exhibition. Alÿs pushed a huge melting ice cube through the streets of the city, walked around with magnatic shoes that gather all metal garbage, drags a drumstick along the surface of city fences and walks around with a gun in his hand until he gets arrested. All these works explore the urban terrain, trigger events and encounters and ultimately reveal the dynamics and diversity of Mexico City. 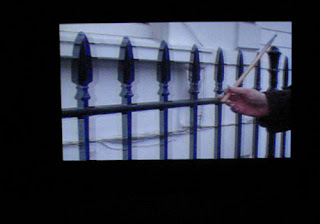 More on Francis Alÿs here and here. The exhibition Mapping the city in the City Art Museum Amsterdam sets out several subjects relating to site-specific art and urban art which I’d like to discuss in a series of posts. The curators have taken up the theories of the flaneur (coined by Baudelaire) and the dérive (coined by Debord) as starting point for the exhibition. Both theories approach the city in a non-functional way. The dérive is an instruction for a city-stroll in which the itinerary is determined by the participants’ intuitive response to the terrain. Such methods open up possibilities for an experimental way of reading the city and have become starting point for many art works. Unfortunately only few artists in the exhibition manage to maintain such an experimental attitude. Francis Alys, Wim T. Schippers, Doug Aitken and Valie Export prove that performance is the best technique to use the dérive as an artistic method. Only their work manages to explore the urban terrain, to respond directly to the environment and to provoke reactions among passers-by. Of course, you can wake me in the middle of the night to come and see a real Jeff Wall photograph. The pictures of Beat Streuli and Philip Lorca diCorcia are beautiful frozen portraits. And I must admit that I couldn’t wait to the see the latest Sarah Morris film, and Miami lived up to all expectations. However, all these works study or document the city, just as it is. I think the theory of the dérive is more than just a method of experiencing the city. As an artistic practice, it enables the artist to work with the dynamics of urban environment; to create works that adapt, respond, interact with the terrain and that ultimately manage to become part of the city flux. The themes the exhibition sets out, as well as the participating artists, are all individually very interesting. But all together they fail precisely on that point: they don’t become part of the city.